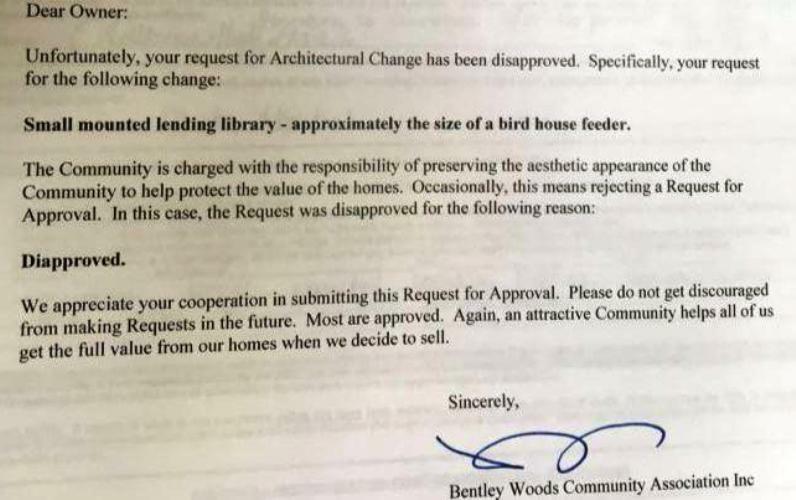 They decided it was after the board governing the Bentley Woods neighborhood voted unanimously last month to direct a lawyer to send the Garicks a certified letter demanding they take down the box filled with children’s books such as “Where the Wild Things Are,” arguing the mini library is prohibited by association rules. The Bentley Woods Homeowners Association has demanded the Garick family remove the Little Free Library from their yard. The HOA in Bob and Autumn Garick's Oviedo neighborhood sent this letter notifying the couple that their request for a "little free library" was rejected. The letter misspelled the word disapproved. Shrum’s letter also asked the Garicks to mail in an “architectural review” application for the library and offered them the option of relocating the Little Free Library to association-owned property near a pond and community bench. The Garicks aren’t interested in that option. The box in dispute is part of the Little Free Library movement started in 2009 by a Wisconsin man who built a book-sharing nook shaped like a one-room schoolhouse to honor his mother, a teacher. 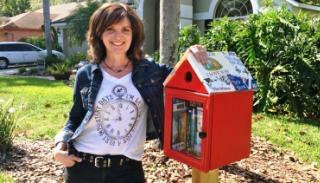 Since then, more than 60,000 have sprouted around the world — including several dozen in Central Florida neighborhoods, according to littlefreelibrary.org, a website for a nonprofit group created to promote community book exchanges. As requested, Autumn Garick, who preferred to keep the little library at her home, sent in the application typically required for building an addition, adding a pool, installing a fence or repainting — all of which need the association’s OK.
Four days later, the association responded with a rejection letter informing the Garicks that their request for the small mounted lending library at their home had been “diapproved” without citing a reason. Autumn Garick, who performs in area schools, libraries and festivals as a storyteller, was heartbroken. She had nurtured a love of reading in her daughters, one of whom, Sydney, will graduate this month from Yale University. Others in the well-kept community thought so, too. About half of the 200-plus households signed a petition Garick carried door-to-door that read, “I like the little library on Bentley Street. Please let it stay.” As an added touch, she handed out book markers featuring birdhouses. Linda Trocine, a real-estate agent and Bentley Woods resident for 25 years, said the homeowner group can protect property values but vague rules and selective nitpicking are why some prospective homebuyers don’t want to look at houses in neighborhoods governed by an association. While some residents believe relocating the Garicks’ lending library to association property is a reasonable solution, Trocine said the group’s proposed compromise seems illogical. The disagreement over the tiny library isn’t the Garicks’ first run-in with the association in their 17 years in Bentley Woods. About a year ago, a board member visited the couple’s home, hoping to persuade the Garicks to take down a sign in their landscaping. The Garicks said their sign was no different — and about the same size as — others allowed on lawns in the neighborhood promoting CrossLife Church. They refused to remove it, and the association dropped the issue. Last month, the Garicks replaced their original little library to a scaled down birdhouse-shaped box near their sidewalk, hoping it would win approval. But it didn’t matter to the homeowners association.